Black rum distilled from fermented molasses. Aged up to five years. A blend of light, very light and heavy pot still rums from the Worthy Park Estate where rum has been made since 1670. Colored with gold-tint sugar-based caramel, this pot still rum embodies the heavy aroma and flavor of Jamaican rum. Over-ripe bananas dominate the aroma and yield to spice, sugar cane and ripe fruit in the body. The finish is reminiscent of the aroma with ripe bananas and vegetal notes. I cannot fathom what is “black” about this. As you can see from the photos, it is the palest rum I’ve ever had. Any paler and it would be perfectly clear. Bottled at 46.5% ABV. There is no age statement on the bottle. Glass: Thin fast legs at first followed by a thicker, slower wave. Never quite seen anything like this. There are distinctly two different legs. Perhaps the difference between the light and heavy rums in the blend? Aroma: Nose of alcohol, bright pineapple, ripe banana, and light caramel. Some dark fruit aromas (prune/raisn?) too belying the rum’s color. If you have too many straight hits it starts to take on a varnish quality. Making me dizzy. Flavor: Bright pineapple and citrus, a little bit of raw sugar and I get a distinct note of mint and anise! the rum has a hint of Schnapps in it! I can taste youth in the rum but depth at the same time. 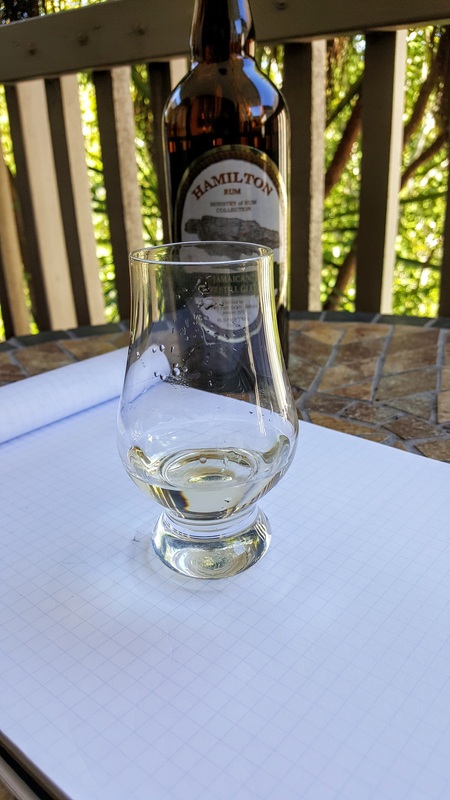 It is much smoother than I would expect with a “young rum” with something like a minty black cherry cough drop on a surprisingly long aftertaste. I’m trusting that the Hamilton name means there is no added sugar in here. the label says nothing about it. The bottle has no “batch number” on it either. Obviously a blend and surprisingly (or at least seemingly) the components are distinctly sensible. This is a little like Smith & Cross (you can also taste two rums there) but smoother, much less “in your face”, and with a mint/anise twist. A good substitute in the rotation. the Smith & Cross was getting a bit overpowering. 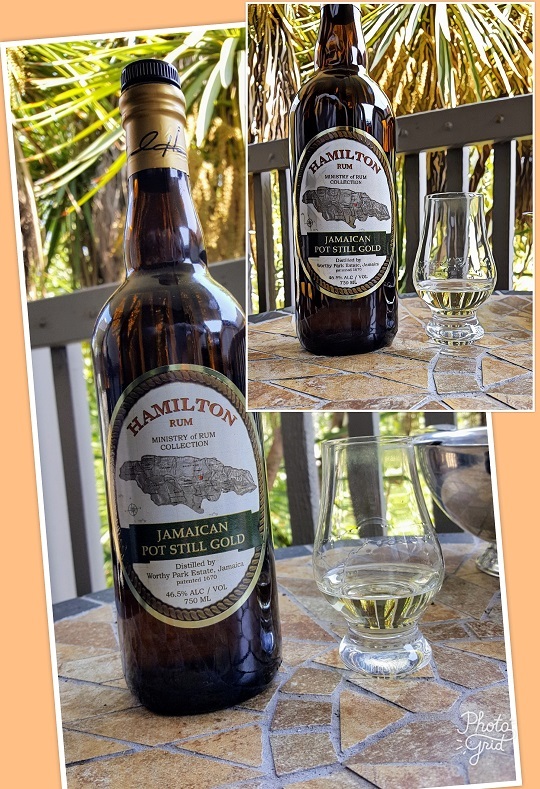 For $24 Hamilton’s “Jamaica Pot Still Gold” an outstanding find for those times when I feel like a change from dark rums.